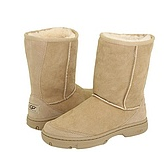 I should also say, 6PM has many “like” Ugg boots too at a great price. When you search for the Uggs, they will give you other suggestions too! I LOVE 6PM.com! You’ll find the other suggestions when you click on one specific style, the other suggestions are on the right side! I agree! My husband was so sad when they stopped making “his” type of work shoes. I can only laugh!